Climate change has a profound effect on organisms but none more dramatic than local population extinction that culminates in species extinction. I describe extinction estimates from lizards, which suggest we are entering into the era of climate forced extinctions. I use a physiological model to predict contemporary extinctions, and test the model across three continents in new surveys which have been conducted after the publication of original model (Sinervo et al. Science 2012). I also develop analogous extinction models, premised on temperature and hydric physiology, for amphibians and test the model across the California biotic province. 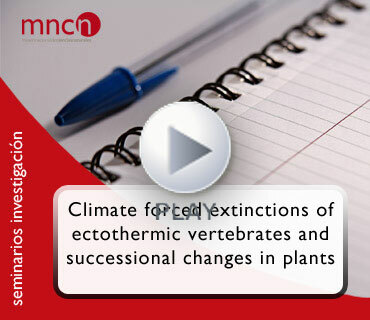 Extinctions in both vertebrate groups is tightly associated with rapid successional changes in plants that elevate local operative environmental temperatures and also decrease moisture, precipitating extinctions. Presentación: Ignacio de la Riva, investigador científico del departamento de Biodiversidad y Biología Evolutiva, MNCN, CSIC. Ponente: Barry Sinervo, departmen of Ecology and Evolutionary Biology, University of California, Santa Cruz, USA.